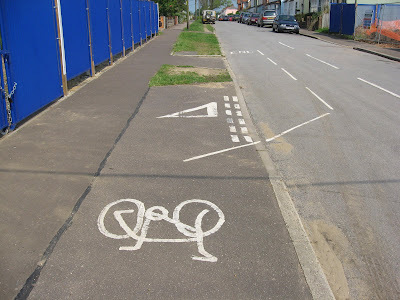 This specially designed short section of a quiet cul-de-sac in Southwold allows Australian visitors to try out the extreme sport known as "cycling in the road". Producing a list of bike-bomb incidents dating to the 1930s, he said the police's mandate to protect the public gives it the right to remove bikes if they are deemed to be a threat. SCOTS are using their cars more than ever before, despite massive efforts aimed at getting motorists on to public transport. The total number of vehicles on Scotland's roads reached its highest level ever last year, latest government figures have shown, while traffic volumes also hit record highs. The total number of vehicles on Scotland's roads rose by 2 per cent, to 2.65 million, in 2007 – the highest ever recorded. The Scottish Government's compendium of transport statistics shows traffic volumes rose by 1 per cent to 27.5 billion vehicle miles, also a record high and a 15 per cent increase on only a decade ago. More than 1,600 civilians ranging from shop security guards, park wardens, housing officers, charity workers, dog wardens and football match stewards have been made part of the "extended police family" under the legislation. Powers extend from issuing fines for truancy, cycling on a footpath, dog fouling and dropping litter to being able to direct traffic and dealing with cases of harassment and trespassing. The accredited workers, who do not wear a uniform except for a small badge, can also demand names and addresses, but do not have the power to detain a suspect. A police helicopter targeting speeding motorists at a cost of £1,000 an hour has been attacked by campaign groups as dangerous and expensive. More than 20 signs are being put up in high-risk accident areas across Essex warning drivers that officers are watching them from the sky.AA president Edmund King said the move could distract drivers, saying: "Putting these signs up could be counter-productive and could lead to more collisions because people are looking at the sky." Sea levels rose by just 2cm in the 18th century, 6cm in the 19th century and 19cm in the 20th century. But the UN's Intergovernmental Panel on Climate Change estimates a rise of between 18cm and 59cm during this century. Other scientists have put the figure much higher based on differing estimates of the effects of melting ice sheets in the Antarctic. Last week the British-based Proudman Oceanographic Laboratory forecast a sea level rise of up to 1.5 metres by 2100. Ten of Britain's most iconic coastal landmarks face being lost forever after conservationists admitted defeat in the battle against rising sea levels. Giant spiders have been banned from a roundabout because of fears they could scare drivers into crashing. The Highways Agency is forcing Arundel Gallery Trail to remove the sculptures from the A27 roundabout only ten days after they were installed because of concerns they could cause an accident. The Causeway roundabout has been used as a gallery for up-and-coming artists for more than a decade. But an agency investigation, sparked by one complaint, concluded the arachnoid art was too dangerous because it could distract motorists. The absurdity and hyprocrisy of the car-obsessed Highways Agency doesn't get much richer than this, does it? 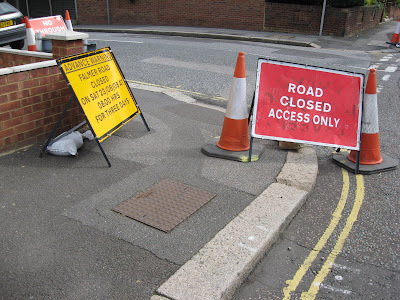 The Highways Agency would never dream of preventing local authorities from installing advertising panels on pavements, designed to attract the attention of passing motorists. 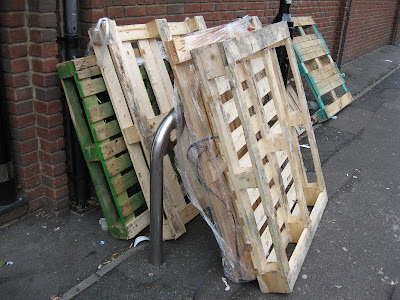 These panels are ugly, they are blatantly obstructive for pedestrians, and they are dangerous when sited like the one below, which conceals pedestrians from vehicles turning left into the Walthamstow station drop-off bay. 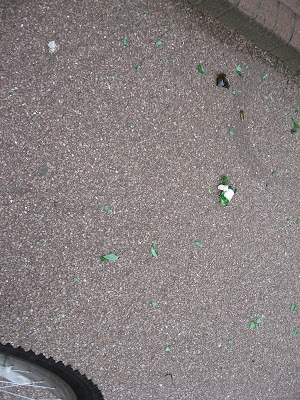 Earlier this year a violent gust of wind (another symptom of extreme weather associated with climate change?) brought wooden panelling crashing down on to the pavement. Any pedestrian passing at the time, and forced towards the panelling by that crap advertising panel, would have been crushed. Luckily no one was passing at the time. The panelling was put back up and that obstructive and distracting advertising panel is still there. 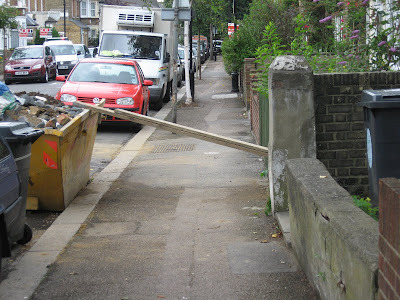 But don't expect this crap council or the car supremacist Highways Agency to give a toss about danger to pedestrians. 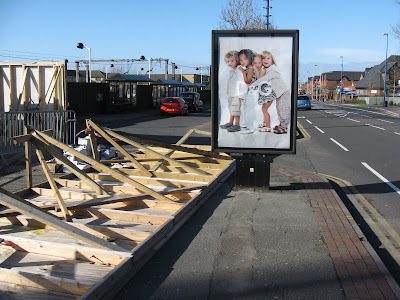 The hypocrisy of the Highways Agency is underlined by the presence of this massive advertising board (below), placed at the Crooked Billet roundabout, which has been the scene of many crashes. 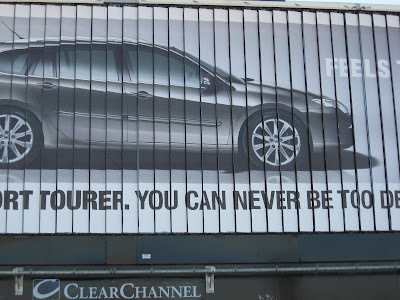 Its capacity to distract is enhanced by the fact that it is an automated board, which changes every thirty seconds as the metal slats turn over to reveal a different advert. The Highways Agency has always loathed cyclists and pedestrians and been indifferent to their safety. 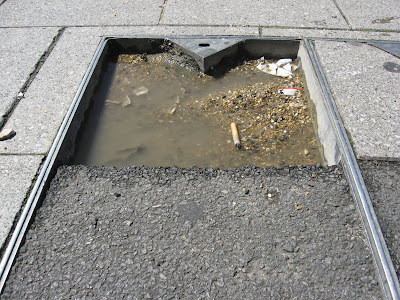 It forces them into subterranean transport sewers like this one (below), at the Waterworks roundabout. 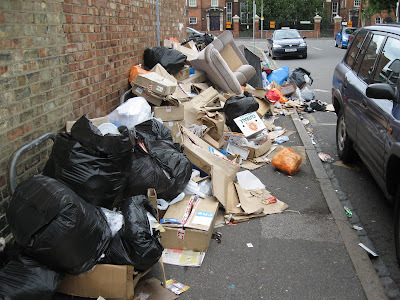 Which is not only unpleasant, neglected, badly maintained, and home to a family of rats, but also, in terms of its isolation, a dangerous and threatening location, with the ever-present risk of assault and robbery. A MAN was killed last night in a horrific motorbike crash near his home. 22-year-old Ajay De-Silva crashed in Hall Lane, Chingford, and died at the scene. Olympic champion cyclist Victoria Pendleton says Manchester road-hogs put her life at risk and shout abuse at her when she trains on the city's streets. 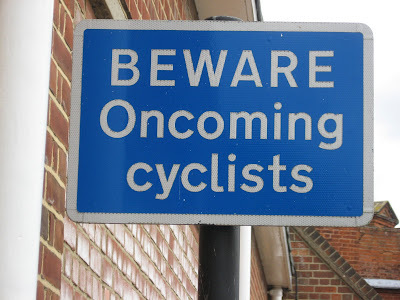 Something which all urban cyclists have surely experienced. 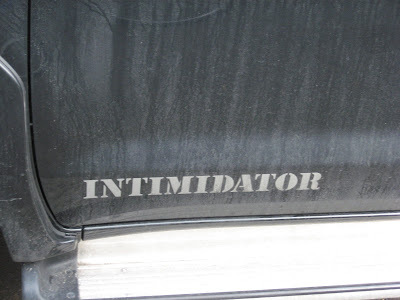 But then hardly surprising when a car manufacturer actually makes a vehicle called ‘The Intimidator’. It does a planet-wrecking 9 miles to the gallon. The Toyota Hilux Intimidator delivers all the reliability and work-ready ability that you would expect from a Hilux, with an extra boost of power, performance and style. A potent 3.0-litre diesel engine is the perfect partner for the Hilux Intimidator, while power is upped to an impressive 163bhp. Modified front-end styling and bigger wheels give a visceral display of strength and style. British motorists have become a safety menace on France's roads, regularly flouting the speed limits after crossing the Channel, French police say. In a four-hour period last weekend, on the A26 motorway near Saint-Omer, a Franco-British patrol stopped 30 cars for breaking the 130km/h (80mph) limit. All but two were from Britain. British drivers have committed half of the most serious speeding offences - over 125mph - in the region this year. A grieving Lochaber family have demanded a review of the way police investigated a crash which killed a champion cyclist. Jason MacIntyre’s relatives also want the Health and Safety Executive (HSE) to investigate whether Highland Council breached regulations on driving at work. Mr MacIntyre died on January 15 after being struck by a local authority pick-up truck on the outskirts of Fort William while he was on a training run. The driver, Robert McTaggart, 36, has since been fined £500 and banned from the road for six months after admitting driving carelessly when he pulled across the path of the father-of-two, a Commonwealth and Olympic games hopeful. Mr MacIntyre’s family has lodged complaints with Ian Latimer, Northern Constabulary’s chief constable, Highland Council and the Health and Safety Executive, and are also calling for a fatal accident inquiry to be held. The family have queried whether a mobile phone had been in use at the time of the accident, and were allegedly advised that investigating officers “did not think it was relevant”. Mr MacIntyre’s father, David, said yesterday that procedures for investigating road deaths in Scotland had not been revised for a number of years despite being updated last year to provide a higher investigative standard in England and Wales. “The manual for Scotland contains no direct reference to the use of a mobile phone by the offending driver,” said Mr MacIntyre. The family initially demanded that death by dangerous driving charges be brought against McTaggart, 36, of 36 Alma Road, Fort William, but their pleas were rejected after a Crown Office review by two counsel. And while on the subject of drivers who put cyclists lives at risk, let me register the fact that the woman driver of a silver car reg. 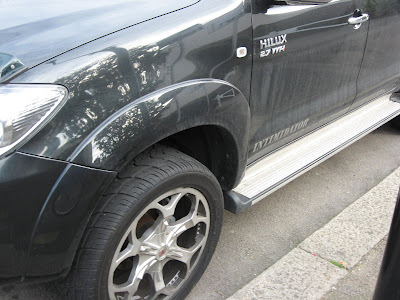 R578 HFS was driving erratically along Aubrey Road E17 at 10.40 am on Thursday, with one hand on the steering wheel and the other clutching a mobile phone, which she was talking into. A COP car with flashing blue lights hit and killed a mum — as it ferried a takeaway to officers, it was claimed last night. The 61-year-old woman was mown down as she walked with her husband and son. Witnesses said the driver of the marked police car had his sirens and lights switched on. The woman, named locally as Sandy Simpson, was pronounced dead at the scene. Witness Ruth Oswald, 53, said: “I heard the siren and then a bang. It was just horrific. The woman was lying in the road and the officer who’d been driving was leaning over her. Witnesses said they saw her distraught husband bang on the side of the police car, screaming: "You've killed my wife" as she lay in the road. One report alleged the driver was using the police siren and blue lights but was not rushing to an emergency, and had in fact been collecting a takeaway for colleagues. A CYCLIST sustained head injuries after colliding with a car in a rush-hour crash. The woman, believed to be in her forties, was cycling near Blackhorse Road Tube station at about 8.24am yesterday when she was struck. If you cycle past the Town Hall on the new off-road cycle lane, remember to duck. And I can’t say I was particularly surprised to find that nothing had changed. There are still signs directing cyclists in the wrong direction. The abandoned recycling box is still there. But there was something new! This. 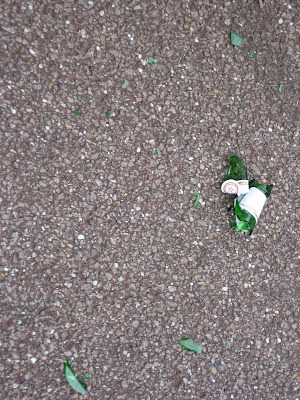 A broken beer bottle, smashed in the cycle lane. On past experience I'd say it will be about a week before it's swept up. 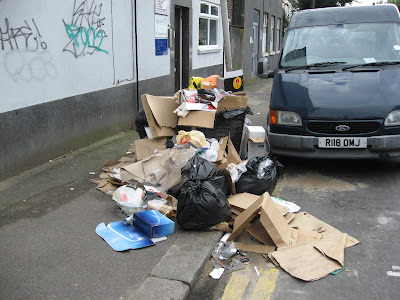 FORMAL complaints about street cleaning have almost doubled since private company Kier took over the contract. But the council is pleased with the £600,000 saving it has made. 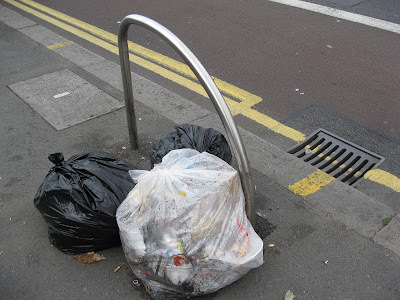 Can you spot the cycle stands in this picture, taken just off Walthamstow's famous High Street? If so, you could win a free copy of the council's Green Charter, signed by environment supremo Bob Belam! Parents, why not give the car a break and let your children walk to school? They can also improve their climbing skills as they make their way over this mountain of crap to Mission Grove School in the background of this photo. Why not collect the series? 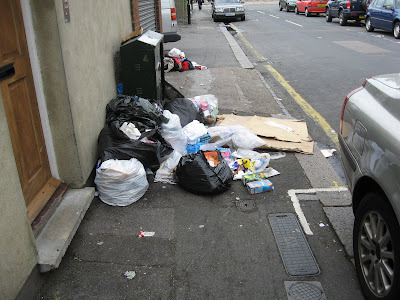 (Below) Outside the post office, 674 High Road Leyton. 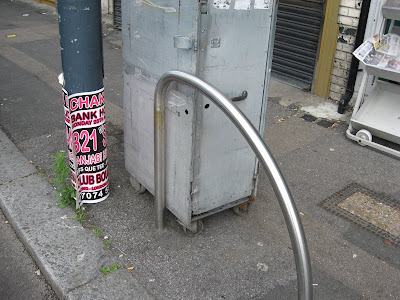 The Council has acted on my previous complaint and required the shopkeeper to remove the chain which attached this metal cabinet to the cycle stand. A big improvement, right? 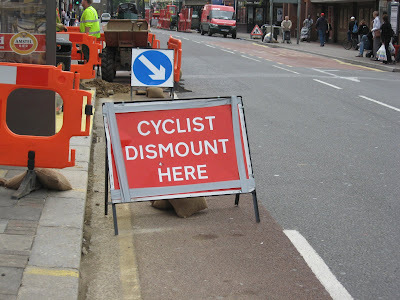 Instead of putting up a large sign reading SLOW - CAUTION - GIVE WAY TO CYCLISTS, the contractors put up a sign instructing cyclists to dismount and get out of the way of drivers. 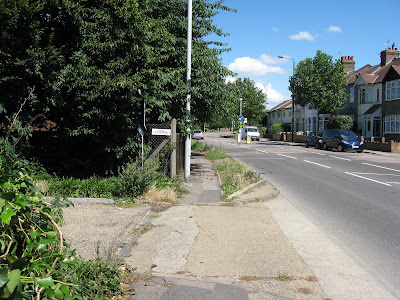 I expect if a cyclist is run down and killed here by one of the innumerable drivers who break the speed limit every day on Forest Road, or who can be seen chattering into handheld mobiles, the police and the Crown Prosecution Service will blame the cyclist and exonerate the driver. Because the cyclist didn't dismount. Falmer Road E17 is closed to motor traffic. So in order to inform drivers of this why not also block the pavement for wheelchair users, people on mobility scooters and carers with double-buggies? Because after all only one in ten Londoners has a mobility handicap, and nobody really gives a toss about them. (Below) Claude Road E10. Why bother to stack signs sideways when you can inconvenience blind pedestrians by stacking them like this? 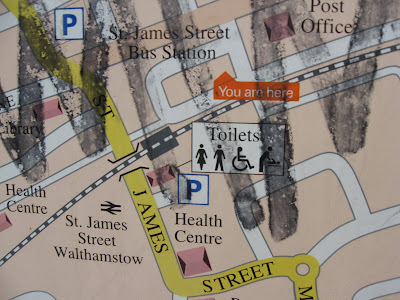 The local paper sarcastically pointed out months ago that a visitor to Walthamstow getting off a bus at Courtenay Place E17 would find themselves greeted by a helpful sign that directed them to public lavatories which were closed years ago. The Council blustered and promised to rectify this unfortunate mistake. 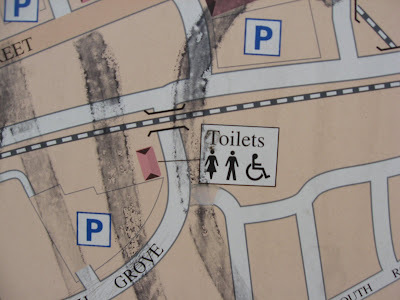 Needless to say it has done precisely nothing and any visitor in urgent need of relief will still find themselves in a spot of bother if they follow the wild goose chase directions on this map. Further up the High Street the Council’s six hour celebrations of the Olympic handover to London today, utilising the Big Screen, with local choirs celebrating global harmony has been cancelled after the Town Square became a crime scene, when in the early hours of this morning a teenager was found stabbed to death. A visitor disappointed by the cancellation of the Olympic celebrations could always take a stroll and sample the local environment. Away from the police tape and the lines of cops there are typical local scenes such as this. Cedars Avenue E17, on the corner with Hoe Street. 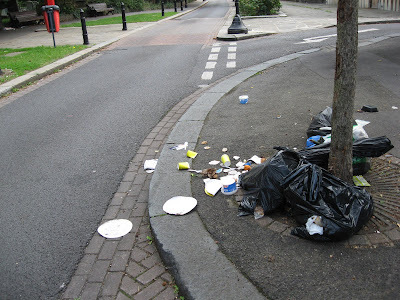 Welcome to the Borough which aspires to be the Greenest and nicest in London. (Below). Saturday morning. 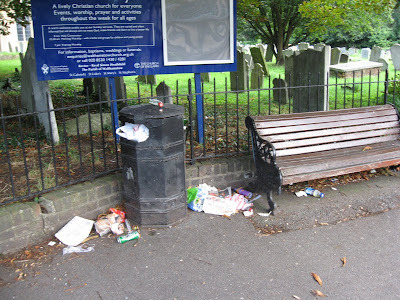 Near the entrance to the path through St Mary's Church, Church End E17. This litter bin is no longer emptied regularly. And just across the road is more squalor. 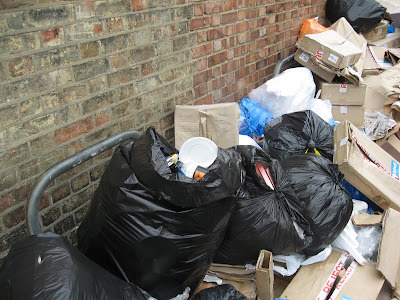 Sacks of rubbish are left uncollected for days, which means that if they contain anything tasty the local foxes will tear them open. 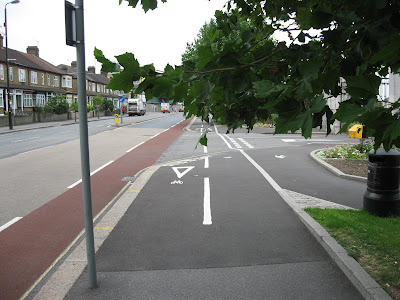 Flair, imagination, humour, a clean and tidy street, well designed and unobstructed cycle stands in a sensible and very visible location... Well, obviously it's NOT the London Borough of Waltham Forest. Flying remains by far the safest form of transport. If you travel by air for a lifetime you have a 1 in 2.5 million chance of being killed. Use the train and that drops to 1 in a 50,000 chance. On the road that becomes a 1 in 200 chance. Last year 2,943 people died on the road. How did the families of each of those cope? An air crash, by the nature of its size and rarity, always attracts more publicity - and far more fear - than road casualties. We hurtle towards each other at 60 miles an hour on small rural roads without knowing what the other driver might do. What happens if he swerves? Or his front tyre bursts? Or he is only 17 (or even younger) and travelling too fast? Nobody knows or really cares? Derek Witt, 60, from Swanwick, was among four riders crossing the bridge on Wednesday evening when he was struck by an oncoming Peugeot 406 car. He died at the scene. Fellow cyclist, 32-yearold Peter Sneddon, from Whiteley, suffered "serious and extensive" injuries to his legs and chest. He was last night in a "serious but stable condition".Both men were married with families.MrWittwas also a grandfather. The cyclists, part of the Woolston-based DHC racing team, were heading away from Southampton and approaching the top of the bridge at about 8.45pm when the dark-coloured car crashed into them. The cyclists were returning from Calshot velodrome where they had been filmed to document the popularity of the sport because of the Olympics. Mr Webber added: "We all ride the bridge quite often. 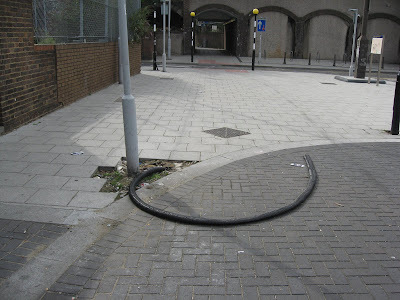 You don't expect it to happen when you have wide lanes and cycle lanes." Julian Gee, chairman of the Sotonia cycle club, the largest in area, said: "Our condolences go out to their families. It's a tragedy whenever a cyclist gets killed and is a reminder to us all how vulnerable we are on the roads." A car was carrying seven people when it was in collision with two cyclists in Hampshire, police have said. All the occupants of the Peugeot 406 car, four men and three women, were arrested with the majority bailed. Residents in Swarland, Northumberland, have been asked to note down registration numbers of cars they think are over the speed limit. Northumbria police will then issue a letter to the alleged offender, and store their details on a database. But the police have be criticised for asking people to become 'do-it-yourself traffic officers' while some claim the scheme will be open to abuse to villagers with an axe to grind. If reported twice, motorists can expect a visit from an officer and after three they will become a target for police to monitor. Police came up with the scheme following complaints that drivers were not slowing down when entering the village from faster country roads. A range of speed calming measures were explored by the council, but none were considered acceptable by highways authorities. A pedestrian knocked down by a vehicle travelling at 40 mph has only a 5% chance of surviving; at 30 mph it is 45%, but at 20 mph the chances of surviving rise to 95%. A 45-year-old woman driver died this morning after two cars collided head-on near Wantage. The accident happened on a bend in the B4494 shortly before 6am, just south of the town. Yikes! 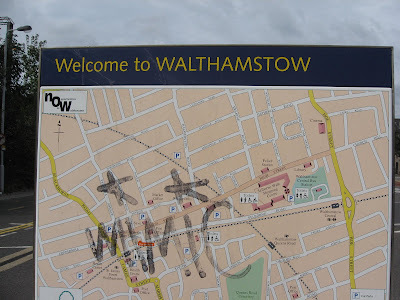 The London Borough of Waltham Forest is more awful than Glasgow. It looks just like a normal sports car, has a top speed of 125mph and acceleration of 0-60 in 3.9 seconds. But the British-built Tesla Roadster, which goes on sale today, has one major advantage - you'll never need to fill it up. The virtually silent car is powered by an 185kw electric motor and a stack of batteries in its boot. However, this is no G-Wiz - it really does perform like a sports car. In central London, with tourists and commuters rushing around, no one could hear the car coming. 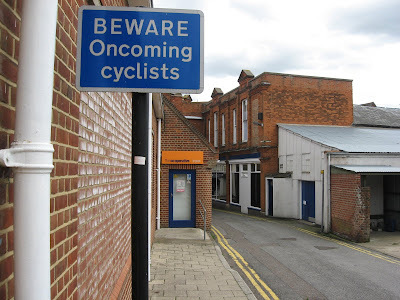 On several occasions I had to slam on the (thankfully very good) brakes as pedestrians walked straight in front, and cyclists were also oblivious. A senior Norfolk police officer has been arrested on suspicion of driving while under the influence of alcohol. David Cameron was attacked by a white van driver who tried to push him into a car as he cycled home from a dinner late at night. One passenger died and many were injured when a coach crashed and ended up on its side. The accident happened following a torrential downpour on a steep and narrow road, just before a tight bend. The coach failed to negotiate the bend and collided with two cars in a driveway before smashing through a wall and coming to a rest on its side in a garden. 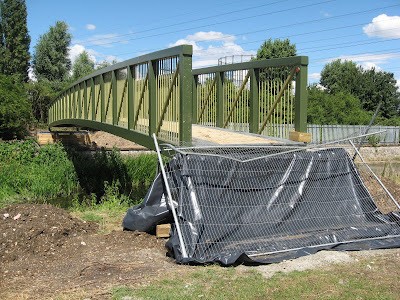 there has not been a history of accidents on the cordoned-off bridge. But he added there was "a very nasty bend" coming down from Alton Towers and it was supposed to be 30mph at the cordon "but people use it like a race track". Smoke from vessels at sea or in port is affecting the air quality of coastal cities, they said. Researchers identified 'primary sulphate' in ship emissions, consisting of tiny sulphur particles less than 1.5 microns across. Breathed in, they can lodge deep inside the lungs and pose a serious health hazard. to force them to walk more and reduce traffic congestion, according to a Government minister. Local Government minister John Healey said that local councils should charge more for basic services such as off-street parking…In a speech to the Local Government Association, he said: "Only one in five councils are using charging to the full potential. Not just to cover costs but to shape their area." A WOMAN is fighting for her life after being hit by a car while crossing the road. The accident, at 7.59am, happened at the junction of Kings Road and Larkshall Road, in Chingford. 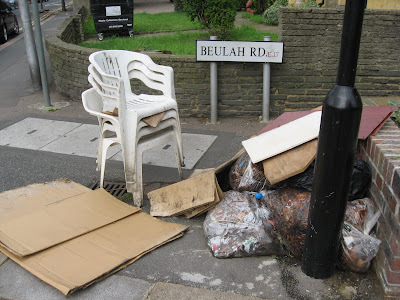 Hyland Road E17. 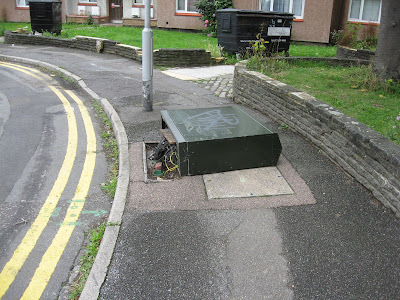 As this is a cul de sac I guess someone did a three point turn here and reversed into this CATV wiring box, wrenching it from its foundations and knocking it flat. It will probably stay like this for months, completely blocking the pavement for anyone using a buggy or a wheelchair. I've noticed Cable TV companies are never in any hurry to repair damage to their equipment. It's probably more profitable just to leave things as they are for as long as they can get away with it. 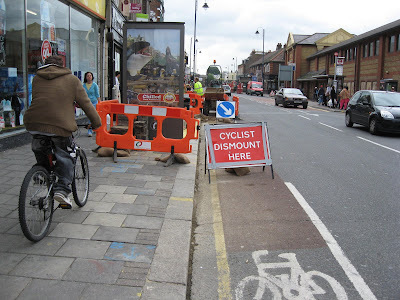 There are roadworks going on in High Road Leyton, and a section of the cycle lane is fenced off. Please, whatever you do, don't cycle past, because you might get in the way of a speeding car, or distract a driver who is busy steering with one hand while texting. 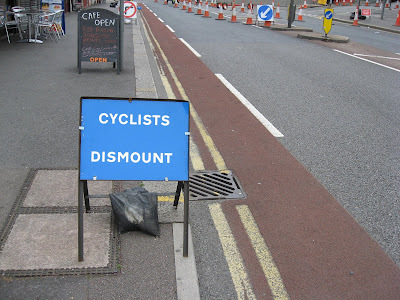 Dismount and walk past on the pavement. You belong to an inferior species. The rest of the road isn't for cyclists, it's for cars. Dismount. At once, do you hear! And as I was taking another photograph this cyclist (below) whizzed by me on the pavement. This is seriously anti-social cycling. Unfortunately this is what happens. Because cycle lanes are frequently obstructed, and because the roads are full of dangerous maniacs in control of a ton of metal, some cyclists respond to all the hassle by taking to the pavement. I wish they wouldn't. Builders at 88 Beulah Road E17, yesterday morning. 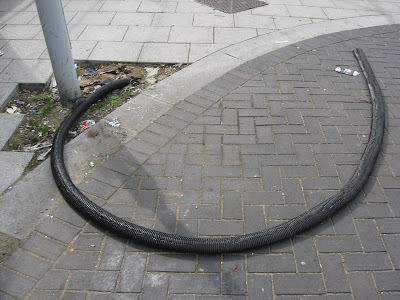 This piece of flexible tubing in the pedestrianised section of Courtenay Place E17 makes the perfect trap for blind pedestrians. It's been there for many months and I've blogged about it before. 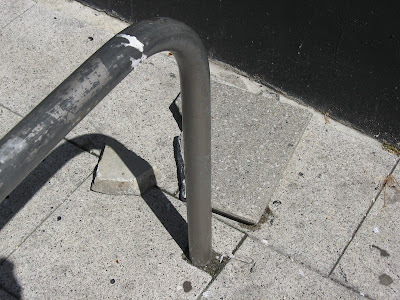 But this Council, which claims to be "positive about disabled people" obviously isn't going to remove it until such time as someone trips over it, injures themselves and either complains to the local paper or demands compensation. It's another example of how detached the council's Green Charter is from the real world. A nice map. Pity it nowhere says 'You are here'. Information. 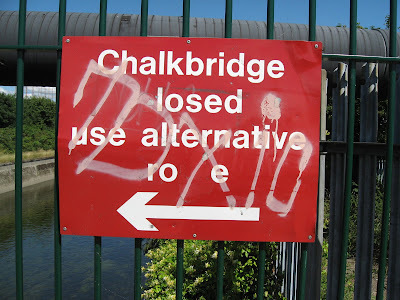 Chalk Bridge is (c)losed. No, hang on. Chalk Bridge is open! Is this Sandpiper Bridge? 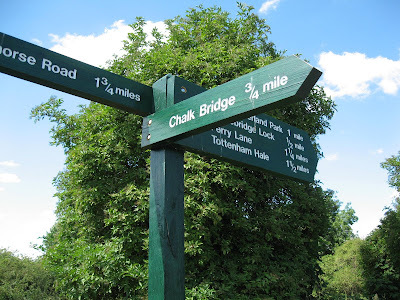 According to the nice map it is, though the signpost indicates that this is Chalk Bridge. 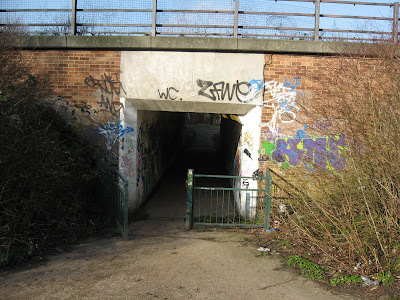 But according to the map Chalk Bridge is much further to the north and not accessible from this side of the waterway, except by crossing this bridge. Which you can't, yet. All very confusing. 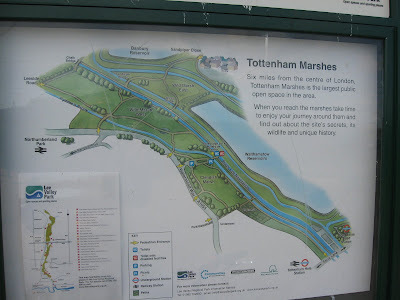 I thought I'd go for a bike ride and explore Tottenham Marshes, where I'd never been before. I was keen to take a look at Sandpiper Bridge, which I read was due to open in March 2008. 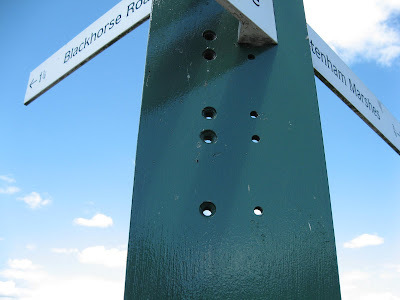 So, equipped with my Transport for London 'Cycle Guide' map (Area 5), I pedalled along Blackhorse Road E17 in search of the lovely green line ride ('route signed for cyclists'), grid reference Zb 25. If you look at this map you'll see that the route just stops dead. 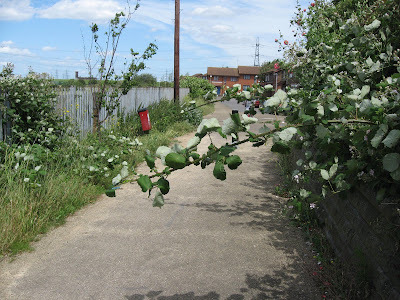 No pathway is marked linking up with Billet Road. I decided that there must be one, so I went exploring. Firstly I went down Lee Close, but this just turned out to be an industrial estate. So I continued along Billet Road. When I reached the bend in the road I realised I must have gone too far, so I went back. 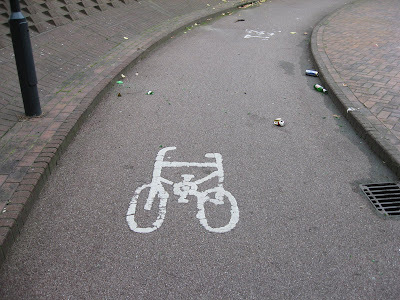 And finally I located the cycle path. The photo above shows the entrance. There's a direction sign but it's completely obscured by vegetation, so it's hardly surprising I missed it. 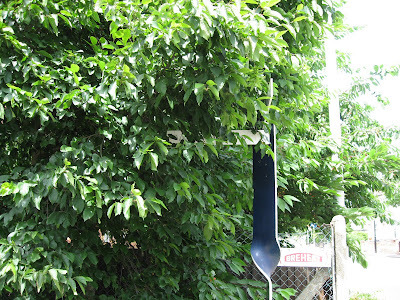 (What looks like a white sign on a pole isn't a direction sign but a commercial notice on the fence.) It is situated at the top of this twirly green post (below). It is not located on the grass verge at the roadside, where passing cyclists would spot it, but well back from the road. Naturally no sign for motorists would ever be located like this or allowed to become totally obscured, but where cyclists are concerned, any crap will do. 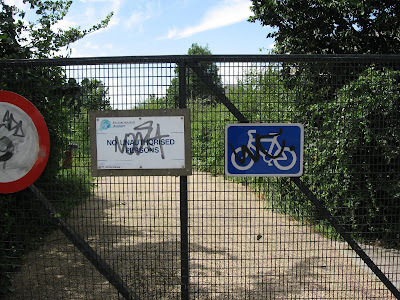 The entrance to the path is to the right of this off-putting gate which bears a sign reading NO UNAUTHORISED PERSONS, next to a cycling logo. Both defaced. Not very welcoming. Not that matters are any better at the other end of this section of cycle path. At the Travers Close end (below) there is nothing to indicate that this is a cycling route, or where it goes. It looks like the entrance to allotments. It’s not clear to me who is responsible for this state of affairs, The crap LVRPA? The British Waterways Board? The Council? Quite possibly a combination of all three. And the crap signing was just the start of my difficulties. More tomorrow. What bothers me about this case is the way in which the police determine that a driver who comes round a bend at speed and kills a pedestrian is not at fault. In this instance it was a pedestrian but it might just as easily have been a cyclist, or for that matter an equestrian. This killer driver was not prosecuted for dangerous driving or for speeding but for other offences. A HUSBAND and wife who tried to cover up their involvement in the death of a teenager in a hit-and-run accident have been jailed. Marilyn Aldridge, 55, hit and killed pedestrian Joanne Cottage as she drove her blue Ford Granada along Ness Road, Shoebury, on February 1 last year. But despite knowing she had injured the 17-year-old Shoebury girl, who died in hospital the next day, she drove off and then picked up her husband Russell Aldridge from IMS, the steel company where he worked in nearby Vanguard Way. Marilyn Aldridge, who had no insurance, contacted police the next day and claimed her car had been stolen in an attempt to avoid prosecution. At Basildon Crown Court, Judge Christopher Mitchell sentenced Marilyn Aldridge to nine months in prison and Russell Aldridge to seven months. Samantha Leigh, counsel for the prosecution, said a police investigation had found the fatal crash had been an accident as there was a blind spot in the road which meant Marilyn Aldridge, would not have seen Miss Cottage until the last minute. Mrs Leigh said police also found no defects with her car and said she had been driving at speeds of between 30 and 42mph along the 30 mph road. The road seems to have been in an urban area, since Miss Cottage, who wanted to go into banking, was knocked down close to an Asda supermarket near her home. I’m reminded of the case of the four cyclists massacred in January 2006 by a driver who had defective tyres and who subsequently admitted he had been driving too fast. Within hours of the crash Chief Inspector Lyn Adams appeared on TV and absolved the driver from any blame. The driver was “not speeding” Adams blandly asserted. It was all the fault of ice on the road. This was a classic instance of a prejudiced officer making instant judgements. Adams failed to consider why no other driver had lost control on this particular bend earlier in the day. At the inquest the coroner registered his disquiet at the police attitude to the driver. In a damning statement, the coroner said police and officials had been "most unprofessional". The jury ruled out accidental death and returned a narrative verdict. Coroner John Hughes said: "The evidence shows classic signs that Robert Harris was driving without due care and attention and to his credit he admitted his responsibility in going too fast. I fail to understand why no proceedings were brought against him." Central London needs 100,000 extra cycle parking spaces to keep pace with soaring bike use, campaigners said today. An Evening Standard survey found dramatic differences in provision for bikes between city centre boroughs. Some of the busiest railway stations had no parking facilities at all. Bike helmets - yes or no? Green councillor Sue Luxton lambastes the policing of the climate camp and the treatment of those who arrived by bicycle: clearly us cyclists are a big terrorist threat, especially compared to climate criminals like E.On. The family of Scottish cycling champion Jason MacIntyre said justice has failed them after his death in a Highland road crash. They have attacked the £500 fine and six-month driving ban handed down to the man behind the wheel in the accident that claimed MacIntyre's life. The MacIntyre family consoled each other outside Fort William Sheriff Court on Thursday, angry and feeling let down by Scottish justice. During a training run near his home in January the 34-year-old MacIntyre was hit by a van driven by Robert McTaggart. Earlier McTaggart had pled gulity to a charge of careless driving. There’s some comment on this case here. NYC cop attacks CM cyclist here. Taxi drivers urged Mayor Boris Johnson to step in after rephasing of traffic lights at a vital West End junction last month led to lengthy delays at the intersection of Holborn and Procter Street. Instead of allowing traffic on different legs of the major gyratory to move in turn, an "all-red" phase was introduced, when the lights show red simultaneously. after being sent to catch a gang of pickpockets. The BMW saloon was written off in the accident at a busy crossing in Westminster. The two officers inside the diplomatic response vehicle were treated for cuts and bruises at the scene. It is thought the driver understeered at a sharp corner while turning into Parliament Street. 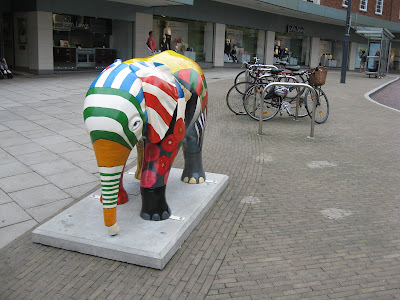 Samantha Nadin had just hobbled across the pelican crossing on crutches. The sales assistant, 37, from Camden, said: "I had got to the other side when I heard an almighty bang behind me. I turned around to look and saw that a police car had gone right through two sets of railings. "It must have been going at some speed to do that. If it had been just a few moments earlier I would have been hit and killed." Playing with a football in the street is a rite of passage for most young boys. But in one particular town, a kickabout could land them on the wrong side of the law. A council in Newark, Nottinghamshire, has sent out letters warning that children face prosecution and fines of up to £100 if they annoy neighbours with ball games. The drive is being led by the council's anti- social behaviour co-ordinator, Lynn Pallett. She said residents have complained of flowerbeds being trampled by children retrieving balls that have been kicked into gardens, while other householders have reported damage to vehicles parked outside their properties. Britain's road-building programme will cost the taxpayer billions of pounds more than expected, with some major projects more than doubling in price in five years, research indicates. 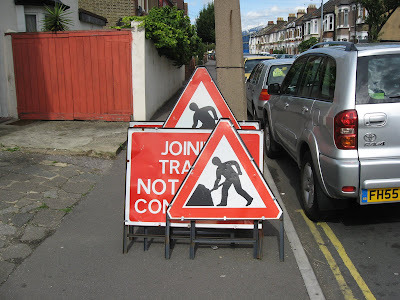 Figures compiled by the Campaign for Better Transport (CBT) pressure group showed that 41 road projects which had been calculated to cost £4.45bn will now cost taxpayers £8.12bn – a rise of almost 83 per cent. A third runway at Heathrow will turn the Piccadilly line into a tourist shuttle and inflict misery on commuters, opponents of airport expansion warned today. Hammersmith and Fulham council said the extra 220,000 flights resulting from a third runway would result in hundreds of thousands more travellers taking the Tube. It said this would cause severe overcrowding on the Piccadilly line - unless longer and more frequent trains were introduced - and seriously affect the quality of life of commuters living in the borough. The council pointed out the line is already running at 97 per cent capacity - "close to breaking point" - and that Transport for London had predicted a doubling of passengers with a third runway. 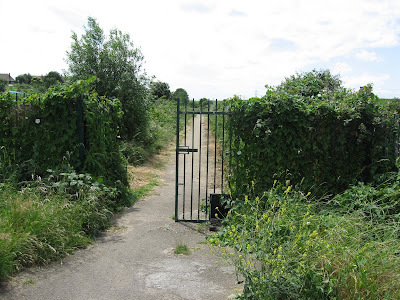 Calling on the Government to refuse a new runway, Nicholas Botterill, the council's deputy leader, said: "Many residents already struggle to find a space, let alone a seat, when Piccadilly line trains roll into the borough." The number of deaths caused by uninsured drivers has risen by nearly a third in six years while offenders have been facing softer penalties. Figures seen by The Times show that average fines for driving without insurance have dropped by 17 per cent since 1997, from £224 to £185. But uninsured drivers are killing four people a week, more than ever before. Only 263,000 uninsured drivers were convicted by magistrates' courts in 2006, compared with 255,000 in 1997, the study found. The Government also expects about 150 motorists a year to be jailed after being convicted of death by careless driving. From Monday, motorists who cause a fatal accident while using mobile phones or switching on a radio face being jailed for up to five years. A driver who is distracted by texting a friend, applying make-up or drinking a coffee and is then in a fatal crash will face the same penalty. Robert Gifford, director of the Parliamentary Advisory Council for Transport Safety, said: “Death on the roads should be dealt with fully and formally. Uninsured drivers are more likely to be involved in a crash than insured drivers. Uninsured drivers are ten times more likely than insured motorists to have a drink-driving conviction, six times more likely to drive an unsafe vehicle and four times more likely to have a conviction for driving without due care and attention. However, under recommendations issued by the Sentencing Guidelines Council, those whose offence involved ‘momentary inattention’ could escape with a community sentence. The most serious lapses in concentration should always incur jail terms up to a maximum of five years, it added. Road safety charity Brake described the SGC’s guidelines as ‘woefully lenient’. A driver who turned right in front of an oncoming car, causing the death of his passenger, has been fined £400. A homeowner whose cottage was 'ripped in two' by a drunk teen driver has branded the British justice system a 'joke' after not being awarded a penny in compensation.Landscape gardener Trevor Gardiner was left with a gaping hole in his cottage when drunk public schoolboy Edward Boyd smashed through his home after losing control of his car. Gardiner spoke out this week after Boyd, 19, a former pupil at £26,000-a-year Stowe School in Buckinghamshire, appeared before magistrates to plead guilty to a string of charges. Canterbury Magistrates Court heard how the teen had been out drinking vodka and Red Bull with friends in Canterbury, Kent, before deciding to drive home while nearly two times over the drink drive limit. As he drove home he lost control of his Volkswagen Polo - a gift from his parents for passing his driving test - and crashed through Mr Gardiner's home. But instead of giving himself up Boyd ran from the scene and called friends to pick him up after the 2.30am crash on June 14th. The court heard last week how Boyd - who admitted drink driving, failing to stop and obstructing a police officer - was caught after police spotted him covered in blood in the car. Boyd also gave the police officer a false name in a bid to escape justice, but eventually admitted his crimes after calling his mother. But in court last week he escaped with just a £400 fine and 200 hours community service. Drivers in London were issued with 140,000 more penalty charge notices (PCNs) over the 12 months that ended in March than in the previous year. motoring organisations said too many tickets are still being given out. "The system may not be in chaos but I think the question of whether it's fair is debatable," said a spokesman for the AA. 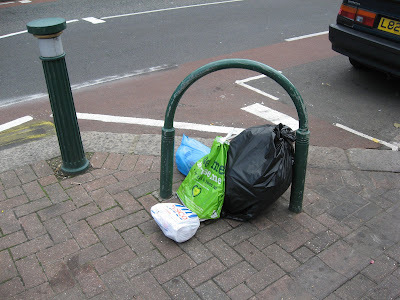 Colin Smith, deputy chairman of London Councils' transport and environment committee, defended the growing number of fines. He said: "Motorists are often irritated to find they have been issued with a ticket but the simple message is if you don't break the rules you won't get one." 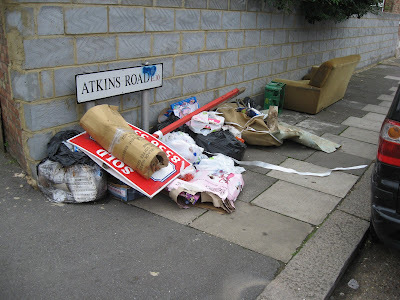 Crap councils never admit they’re wrong, do they? Hilariously, after being caught out publishing a leaflet which erroneously showed the skyline of Birmingham, Alabama, a Birmingham city council official blustered The picture on the leaflet is meant to symbolically represent an urban area. In the USA, sales of Hummers have plummeted by 40% in the US this year. In Britain motorbike sales are up by 22 per cent, to 14,306, as people flee congestion charges, increased car taxes and the rising cost of fuel. A clean-up operation is under way in Northern Ireland after torrential rain caused floods in many areas. Rivers burst their banks and countless roads were impassable, leaving motorists stranded. Others had to abandon their cars in flood water. Hundreds of homes and businesses were also badly damaged. There are few more depressing descriptions in the English language than "cycling campaigner" Says novelist and journalist Will Self, who puts forward ad hoc measures that could make it easier for two-wheelers. A biker who reached speeds of 130mph (209kph) on an A-road through Wiltshire has been sent to prison for 15 months. Business leaders and motorists have complained to Devon and Cornwall police about the amount time taken to investigate road crash scenes. The average road closure after a serious crash is about six hours, which can lead to long tailbacks. In fact this story cites just one individual: Tim Jones, of the Devon and Cornwall Business Council. The collapse of the polar ice caps would become inevitable, bringing long-term sea level rises of 70-80 metres. All the world's coastal plains would be lost, complete with ports, cities, transport and industrial infrastructure, and much of the world's most productive farmland. The world's geography would be transformed much as it was at the end of the last ice age, when sea levels rose by about 120 metres to create the Channel, the North Sea and Cardigan Bay out of dry land. Weather would become extreme and unpredictable, with more frequent and severe droughts, floods and hurricanes. The Earth's carrying capacity would be hugely reduced. Billions would undoubtedly die. All our policies to date to tackle global warming have been miserable failures. So are all our efforts doomed to failure? Yes, so long as our governments remain craven to special interests, whether carbon traders or fossil fuel companies. Popular services to the capital are slower than in 1987 despite rail network and rolling stock improvements. Critics say rail firms are "padding out" timetables by adding a few minutes to journeys between key stations to ensure trains arrive on time. Met police staff have been caught using their passes illegally to avoid paying for train travel. The startling loss of Arctic sea ice has major meteorological, environmental and ecological implications. The region acts like a giant refrigerator that has a strong effect on the northern hemisphere's meteorology. Without its cooling influence, weather patterns will be badly disrupted, including storms set to sweep over Britain. What really unsettles scientists, however, is their inability to forecast precisely what is happening in the Arctic, the part of the world most vulnerable to the effects of global warming. 'When we did the first climate change computer models, we thought the Arctic's summer ice cover would last until around 2070,' said Professor Peter Wadhams of Cambridge University. 'It is now clear we did not understand how thin the ice cap had already become - for Arctic ice cover has since been disappearing at ever increasing rates. Every few years we have to revise our estimates downwards. Now the most detailed computer models suggest the Arctic's summer ice is going to last for only a few more years - and given what we have seen happen last week, I think they are probably correct.' 'It does not really matter whether 2007 or 2008 is the worst year on record for Arctic ice,' Maslowski said. 'The crucial point is that ice is clearly not building up enough over winter to restore cover and that when you combine current estimates of ice thickness with the extent of the ice cap, you get a very clear indication that the Arctic is going to be ice-free in summer in five years. And when that happens there will be consequences. A BOY has been taken to hospital after his pushbike was in a crash with a car. The teenager was taken by air ambulance to the Royal London Hospital after the accident in Fulbourne Road, Walthamstow, just after 4pm. "It is vital that councils invest more money in keeping public walkways safe, as falls are a leading cause of death for over 75s. We also understand that older people are less likely than other age groups to seek compensation when they fall, even though suffering a fall can shatter their physical and mental well-being." 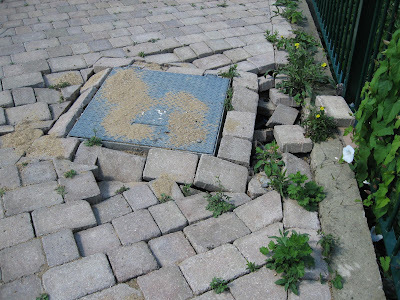 The latest figures show that more than 2,300 older people fall on broken pavements every day. Of the 609,500 who fall every year, 80,000 then become afraid to leave the house. And where else would you expect to find this missing flagstone than in pieces by the nearest cycle stand?